Engaging financial customers -- whether through a compelling brand, phenomenal products or effective problem resolution -- requires providing them with five-star channel experiences. But in today's changing marketplace -- with evolving customer preferences and increasing technological innovations -- leaders may feel confused about how to most effectively deliver the perfect channel experiences their customers expect. Here are five strategies for maintaining consistently positive channel experiences. Understand customers' channel needs via analytics. To meet and exceed customer expectations, leaders should embrace the power of predictive analytics and customer data. This means fostering a data-driven culture that is equipped to discover and analyze customer needs and take meaningful action for better business performance. For example, customer analytics can help banks understand how and why different types of customers use particular channels for their banking needs. In addition, customer analytics can help banks identify which channels customers prefer for conducting each type of banking transaction, depending on the circumstance. Gallup analytics show, for instance, that when it comes to problem resolution, three in four customers (75%) prefer to use personal channels (such as branches and call centers) to report and resolve their problems. People who report problems using digital channels actually use both personal and digital channels to resolve their problems. With this information, banks know that premium service in personal channels is vital to turn threats into opportunities to engage customers. A data-driven, high-performing financial institution knows what its customers want and leverages that information to improve channel experiences. This takes not only the right customer data and analytics systems, but also employee support -- through a culture that can understand and act on data. Place talented employees on the front lines. Despite the rapid development of digital channels, customers still turn to personal channels for complicated banking needs such as seeking financial advice and purchasing new products. This means that customer-facing employees should be innately talented consultants. They need to serve customers with respect and courtesy and maximize convenience and efficiency. They should possess an inherent, genuine desire to help customers and a sense of ownership to proactively follow up until customers' needs are satisfied. And they need to go beyond selling products -- asking smart questions and providing meaningful solutions. Leaders have to ensure that branch and call center employees have the right talents to address customers' complex and emotional needs. To this end, financial leaders and managers should hire naturally talented individuals and position employees based on their strengths. Prioritize optichannel experiences over omnichannel experiences. Customers expect perfect service with each interaction -- more so than they desire the convenience of a wide array of channel options. 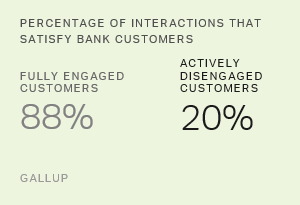 Gallup finds that fully engaged customers are "extremely satisfied" with 88% of their interactions with their bank, while actively disengaged customers are extremely satisfied with only 20% of their interactions. In fact, customers at all engagement levels use the same number of channels, which points to channel satisfaction -- rather than the number of channels offered or used -- as the primary differentiator between fully engaged, indifferent and actively disengaged customers. While customers expect the convenience of multiple channels -- banking wherever, however and whenever they please -- financial leaders should emphasize optichannel over omnichannel experiences. Providing consistently optimized experiences is more important than providing the convenience of multiple channels. Create a customer-centric environment. Any organization seeking to deliver premium channel experiences needs to make customer centricity a central strategy at all levels. Employees in all roles -- not only customer-facing employees in branches and call centers, but also workers in supportive roles -- should prioritize customer experiences in everything they do. Managers and leaders should frequently remind employees of how their work affects customers' channel experiences. For example, although technology teams don't often speak to customers directly, they play pivotal roles in crafting seamless digital experiences that build customer engagement. Align employees with the brand promise. While most financial leaders can clearly articulate their bank's brand promise, they are likely unaware of how well its brand connects with its employees, who are living, breathing examples of the bank's brand for customers. Across many banks studied, Gallup sees a significant gap between a company's brand promise on paper and how employees perceive and deliver on that brand promise. This means that with most customer interactions, employees are not adequately sharing and living out their bank's brand promise. Financial leaders should use data and analytics to discover where their employees are not aligned with the brand promise. With this information, leaders can connect their brand with each worker and bring their brand to life with customers. No two financial institutions are identical -- and every bank needs a tailored customer engagement strategy to achieve the highest levels of engagement. But regardless of size, type or region, all banks need to enhance channel experiences to engage customers. For banks, five-star customer engagement strategies require flawless channel experiences. Customer engagement strategies should be well-rounded -- but ultimately revolve around providing perfect channel experiences.